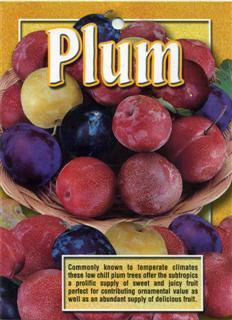 Commonly known to temperate climates these low chill plum trees offer the subtropics a prolific supply of sweet and juicy fruit perfect for contributing ornamental value as well as an abundant supply of delicious fruit. 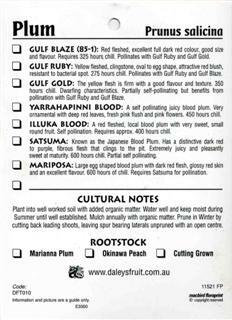 ﻿GULF BLAZE (85-1): Red fleshed, excellent full dark red colour, good size and flavour. Requires 325 hours chill. Poliinates with Gulf Ruby and Gulf Gold. GULF RUBY: Yellow fleshed, clingstone, oval to egg shape, attractive red blush, resistant to bacterial spot. 275 hours chill. Pollinates with Gulf Ruby and Gulf Blaze. GULF GOLD: The yellow flesh is firm witn a good flavour and texture. 350 hours chill. Dwarfing characteristics. Partially self-pollinating but benefits from pollination with Gulf Ruby and ,Gulf Blaze. YARRAHAPINNI BLOOD: A self pollinating juicy blood plum. Very ornamental with deep red leaves, fresh pink flush and pink flowers. 450 hours chill. ILLUKA BLOOD: A red fleshed, local blood plum with very sweet, small round fruit. Self pollination. Requires approx. 400 hours chill. 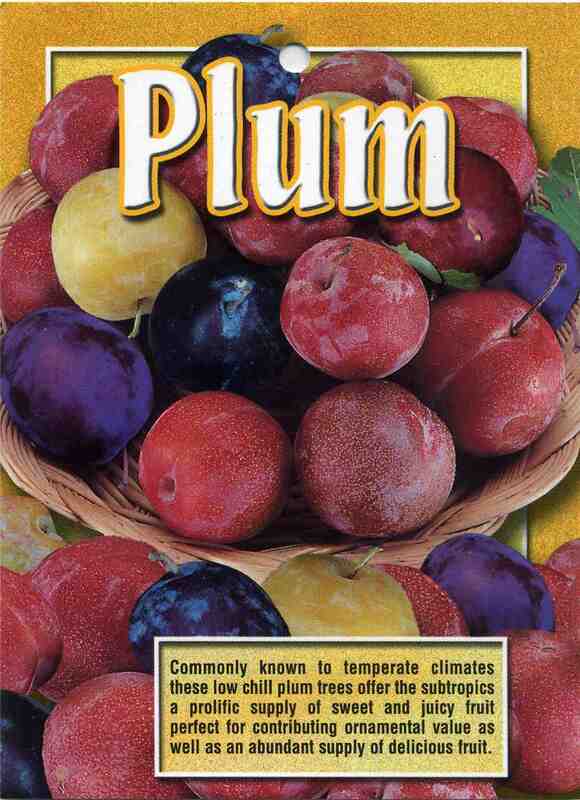 SATSUMA: Known as the Japanese Blood Plum. Has a distinctive dark red to purple, fibrous flesh that clings to the pit. Extremely juicy and pleasantly sweet at maturity. 600 hours chill. Partial self pollinating. 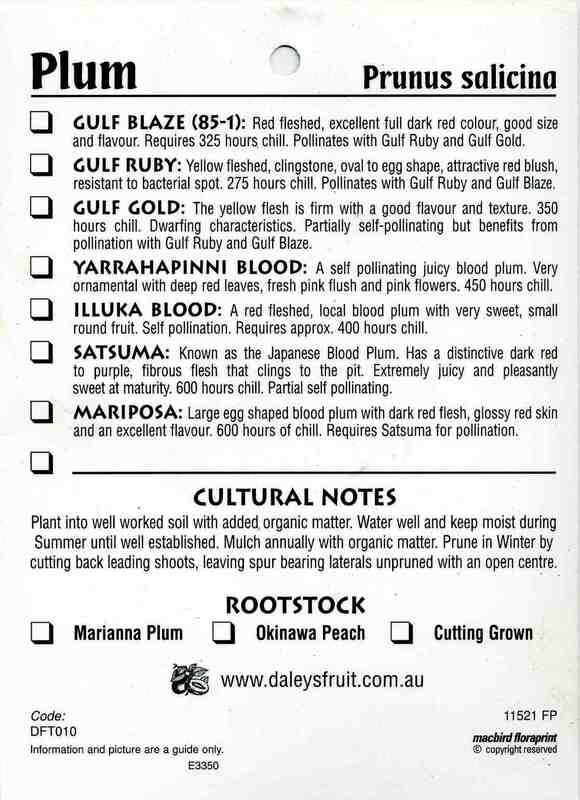 MARlPOSA: Large egg shaped blood plum with dark red flesh, glossy red skin and an excellent flavour. 600 hours of chill. Requires Satsuma for pollination. Plant into well worked soil with added organic matter. Water well and keep moist during Summer until well established. Mulch annually with organic matter. Prune in Winter by cutting back leading shoots, leaving spur bearing laterals unpruned with an open centre.